Today I went on the most delicious bike ride. The temperature was ideal. The leaves are still green, but Fall is in the air. The bike path follows a river. There were a few sail boats floating idyllically. It was very picturesque. I often have to distract myself with music or podcasts when I exercise, but I didn't want any distractions today. I just wanted to savor the beautiful weather and scenery. Pasta was first referenced in Sicily in 1154. Wikipedia claims there are 310 forms or shapes of pasta called by over 1,300 names. In Italy, pasta is traditionally prepared three ways: pasta asciutta, pasta in brodo, and pasta al forno. 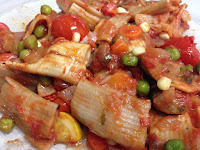 Pasta asciutta is cooked and served with a sauce or condiment, pasta in brodo is more like a soup, and pasta al forno is baked. Pasta is usually made with durum wheat powder and water. Durum is a hard wheat. It is low in gluten so it's rare to find bread make solely with durum wheat. I made this little gem of a a recipe up myself. 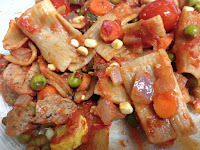 The ingredients are 1 red onion, 2 tablespoons extra virgin olive oil, 1 garlic clove, 1 cup carrots, 28 ounces marinara sauce, 1/2 cup water, 1 tablespoon salt, 1 ear of corn, 1 small yellow squash, 12 ounces chicken sausage, 1 pint cherry tomatoes, handful fresh basil, 1/2 teaspoon crushed red pepper flakes, 2 cups frozen peas, 1/4 cup parmesan cheese, and 16 ounces whole wheat pasta. I added chopped squash and corn. I cut the kernels of corn off the ear. I added the cherry tomatoes, finely cut basil, and crushed red pepper flakes. I let this simmer for an additional 15 minutes. I cooked the pasta according to the package's instructions while the sauce simmered. After 15 minutes, I added the peas, pasta, and grated parmesan. I also ended up adding a bit more salt. This made so much food. I ate it forever. If you're single, make this for friends because otherwise it will last you forever. This was good and hearty, but it wasn't as toothsome as the shrimp red curry I posted last week. That curry was amazing. This was filling and packed with nourishing, bright, and tasty vegetables. 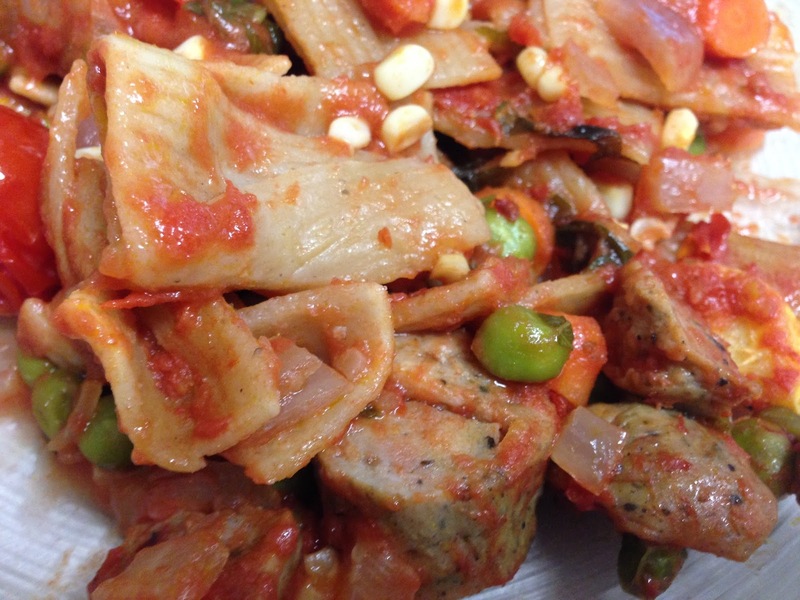 This is a good recipe when you need something healthy that will stick to your bones. It would make a good meal in winter. Of course, you wouldn't be able to find locally grown squash and corn in winter. What a dilema.